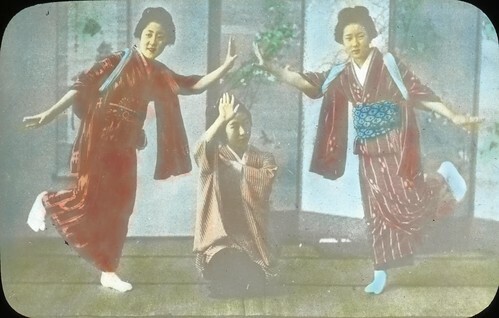 Image Description from historic lecture booklet: "The geisha houses, rather humble, certainly unpretentious abodes, group themselves in certain quarters, and the hiring of the girls is done methodically through a central office. The hiring should be accomplished by the restaurant keeper or by the housewife as early in the afternoon as possible, but not after six in the evening, unless absolutely unavoidable. For the preparation of the Geisha is an elaborate affair from the wonderful coiling and adorning of her hair to the fit of her white, heelless shoes. They are taken in rickishas to the house of entertainment and carried home in the same way when all is over. The ordinary examples of the fine arts that one meets in the homes of Japan are the pictorial scroll or Kakemono with a picture above three feet long and half the width that hangs in the place of honor--in a recess called the tokonoma, and possibly a bronze or pottery statuette standing in a low pedestal in the same recess. A fine vase of metal or else a wonderfully decorated sword often takes the place of the statuette. Whatever it may be, it is there to be judged on its merits free of all competition with others of its kind, for the good lady of the house, though she owns ever so many pictured scrolls or statuettes or vases, will only exhibit on of a kind at a time. No walls hung with scores of pictures or shelves, or an array of pedestals about the rooms, enter in other scheme of domestic decoration in Japan, In some of the of the wealthiest homes, particularly those of noblemen who have traveled abroad, a "Western parlor" may be found furnished sumptuously in European style, and on whose walls hangs oil paintings in gold frames bought in the course of residence in European capitals."